A YEAR OF JUBILEE REVIEWS: Kelly's Kits Review & Giveaway!! Kelly Kits is very excited to sponsor the Keeping Kids Creative Giveaway Hop in September! Kelly Kits are an all inclusive art-play curriculum for children ages 2 to 102! Kelly Kit activities introduce a broad variety of tools, materials and art techniques in 5 art disciplines: painting, sculpting, drawing, printmaking, and collage! Each activity also includes an enrichment idea that adds an educational component to each art-play experience! Each kit has enough materials for 2 children to participate. That ends up working out great in our family with the 7 and 10 year old participating. 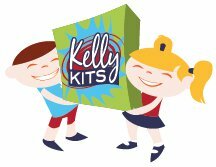 The Kelly Kits subscription is a monthly mail-out of a single activity for your kiddo with online membership to instructional video and monthly contests, drawings, and prizes! All instructions and materials are included! My kids have used rubber stamps to make cards with ink based stampers. It was so fun for them to use the unique sponge paper to design their own sponge stamp. The ideas are boundless. My son thought of a rocket ship and my daughter designed a butterfly. It was so fun designing the sponge design and then running it under the water to watch it grow! They even cut mini sponge stamps out of the remaining sponge paper, leaving nothing left! Such fun to first try the red and yellow paint separate, then they combined it to make orange. I honestly love art projects and with my oldest 2 we did art at least a few times a week. The younger ones aren't getting that same amount of art time with mom being busier :( I love how these kits are pre-assembled, and all I need do is sit down with them and get creative. The work behind the project is already done for me and I can just enjoy my children! The contest is a drawing to win an annual subscription for one lucky winner! Everyone who enters the contest will get one FREE Kelly Kit just for entering! So, everyone who enters is a winner and will receive a voucher code to redeem their FREE Kit! Enter to win 1 YEAR of Kelly Kits!! Follow this link for entry!